Since 2004 I've taught myself, and others, in just about every discipline the Source engine offers. Has it really been over a year since my last post here? Time for an update. Creating world: easy. Populating world: not. I've long since abandoned Enclave, as it began to demand too much re-engineering. 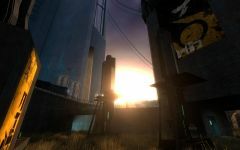 Half-Life 2 is a linear rollercoaster and about as far away in design terms from Deus Ex as it is possible to be within the FPS genre. There were also issues with player motivation that would have to have been overcome were I to stick with Gordon "silent protagonist" Freeman. Despite this, the biggest stumbling block proved to be animation. Promoting Valve's citizens to the foreground made their animation set look extremely pallid, and all my attempts at decompiling the models failed in one way or another. Even if I had succeeded, XSI's SMD importer only half works. I'd go so far as to call the pre-compiled nature of models one of the fundamental problems with the Source SDK at the moment, at least for those of us working on narrative projects. Valve are releasing the TF2 model sources, and I sincerely hope they follow them up with Half-Life 2's citizens, metrocops and soldiers. Just not in SMD, please! After shelving Enclave I drifted away from modding until I discovered Jailbreak: Source. Jailbreak UT2004 is still my favourite multiplayer mod and I inevitably didn't find its Source counterpart quite to my tastes, it being slow and unwieldy, with most games entering a stalemate where each team occupies the other's base. The tug-of-war feel I loved in JB:UT, where releases happened so often that each game became more tense as you came closer and closer to incarcerating the entire enemy team, isn't there. Instead of moaning on the forums I started on a map that would fix the problems I saw. Unlike the official arenas, jb_openday is small, circular, and has wide open "bases" that are impossible to lock down — each element intended to make matches ebb and flow faster. The speed of each round made escapes pointless, so to keep captured players engaged I removed the ceiling of each jail instead: those inside can shoot out at anyone who tries to walk along the top of the walls (once thrown a gun), and the other team can shoot back in, which with the minigun in hand never fails to entertain. 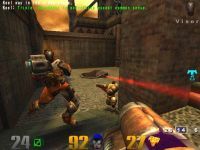 Quake Live with lagcomp, please. The biggest problem with Openday is actually its small size, which limits the number of players it can support and makes a lot of matches too quick. 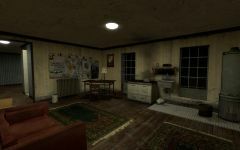 But a larger map would have broken down entirely, as player movement is simply dog slow in JB:S. It's part of another malaise with the SDK: that its multiplayer component, HL2DM, is literally HL2 with networking and respawning, and despite its name isn't balanced for the pace of deathmatch play at all. At the moment I'm ploughing through creating weapons. The VDC wiki's documentation on the process is either missing or utter crud, which if you're me means writing it anew...and that means laying all the groundwork first! Your avatar is nice :D did u draw and creat?? May I ask if you are an admin in here or something? You act with a lot of confidence and add stuff. Your news post regarding Alien Swarm was a bit misunderstood by Praz (Orion). I saw your tutorial for the broken mods, so I wanna ask, can you code or why do you know so many things? I document I learn on VDC. Quite aside from helping others it makes me thorough, which I like.